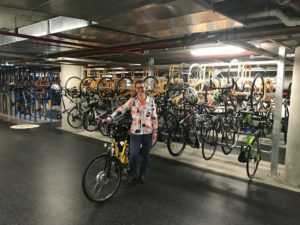 Last year I attended a cycling summit at the Lend Lease building at Barangaroo on the edge of the Sydney CBD and I was very impressed by the great facilities for bike commuters. I think all businesses should be incorporating this type of amenity to encourage more people to ride to work. I interviewed Paul Morgan from Lend Lease via email. Q: How many bikes can you accommodate in your bike parking area? We have 1,100 bike racks. Q: Whose brilliant idea was the facility? The Barangaroo development has received Green Building Council of Australia 6 Star Green Star awards for each building. Lendlease designed and built the end of trip facility to achieve the highest rating to attract the very best tenants who wanted to work in a 6 Star Green Star building. Q: As well as bike parking, what other facilities/services do you offer? To meet the needs of the end of trip users, we have 1,460 lockers and 132 showers in 24 purpose built change rooms. All users have free use of towels, body wash, ironing boards and hair dryers. We also have two bike maintenance stations with bike stands, tools and tyre pumps. Users can also arrange for a mobile mechanic to maintain their bike. Q: Are the facilities shared by all tenants in the buildings? Who pays for it? The facilities are paid for by the office building tenants who choose to have the facility as part of their lease. They can then arrange access for their workers. Q: What percentage of users are women? Approximately 35% of users are women who either cycle or run to work or use the facility for lunchtime activities such as running clubs, boot camp, etc. Q: What do you do to encourage workers to use the facility? Workers are made aware of the facility as part of their company induction. Tours can then be provided by JLL, the facility managers either for new workers or for anyone interested in using the facility. Q: Do you think this is the way of the future? 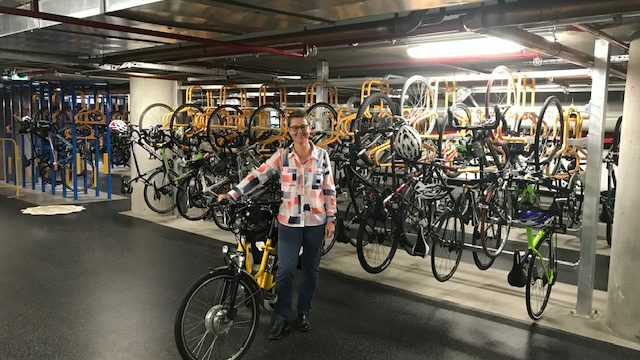 Yes, the City of Sydney Council are seeing an increase in the number of office buildings installing or renewing their end of trip facilities and often use Barangaroo as an example of what is possible. Demand for the facility has always been high as employers realise the benefits of a healthy workforce and workers look for facilities to meet their diverse travel and exercise needs. What type of great facilities for bike commuters does your company offer? Share via comments or the Women Who Cycle Facebook page. So…. can the business or individual get a tax offset for their employees utilizing active transport??? We contribute less to emmisions, congestion, health care etc… so how do we incentivise this for businesses and or individuals?? Just food for thought Nic. Virtue is its own reward, and no doubt these facilities attract the right sort of workers and companies. I think these facilities are definitely important for big cities. Thanks for sharing! Bike commuting is such a great way to stay active.